Life preservers are the seatbelts of swimming: we all know we should wear them, but some of us refuse, no matter how dangerous that refusal might be. Instead of debating over wearing the big orange life vest, Kingii offers an unobtrusive way to stay safe at the beach. The little device fits on your wrist; one component is a bit larger than a pack of bubble gum while the other component is roughly the size of a can of pepper spray. 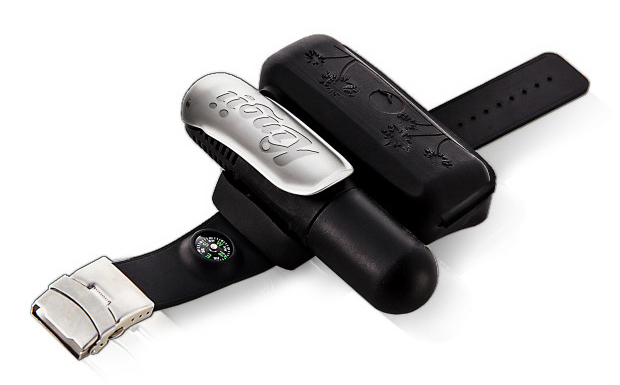 They’re mounted on a waterproof wrist band and the whole thing allows for a full range of movement when worn. A built-in compass on the wristband can help you find your way back to shore, and a whistle makes you more easily findable to rescue workers. If you get into trouble in the water and need a lift, all it takes is a simple pull of a lever. A CO2 cartridge quickly inflates a buoyant orange pouch that carries you right up to the surface of the water. After you use it, Kingii is fully rechargeable; just fold up the balloon and tuck it into its pocket, then put a new CO2 cartridge in place. The Kingii’s inventor, Tom Agapiades, was inspired to create the device after a close friend drowned in a lake. The project raised hundreds of times its fundraising goal on Indiegogo; after its initial run it will retail for $89.99 on Amazon and elsewhere. See more in Home & Personal or under Gadgets. July, 2015.